Tetris has always been a classic game, one that appealed to audiences of all ages. It has used a number of different consoles in the past, from PCs to cell phones, calculators and even web-based platforms. 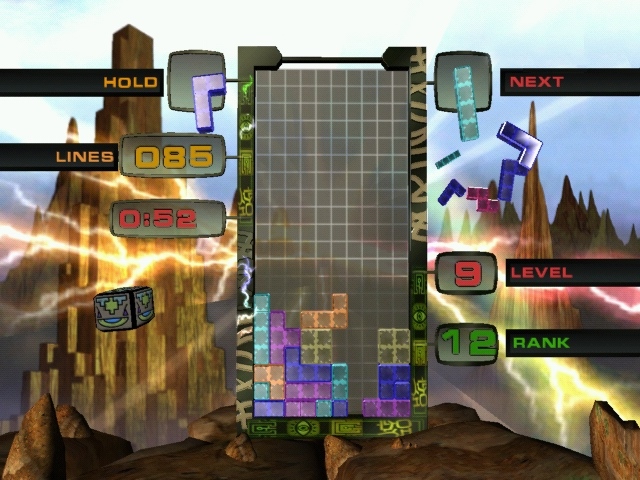 Now, Tetris has wiggled its way into PS2 as Tetris World, along with a number of different variations of play and new modes. Unlike other Tetris games, Tetris Worlds has an overall objective that needs to be reached. The plot revolves around the evacuation of the Minos population from Hadar 4 to six other planets that are suitable for the Minos people to live on. Your job is to make sure the “Tetrion gates” are opened on those planets in order to allow for the safe evacuation of the Minos citizens, and that’s done through the different Tetris levels. Tetris music has never been something appealing to audiences, so unfortunately, the techno beats and industrial soundtracks are here to stay. The new Tetris World field is filled with a number of different backgrounds ranging from deserts, icy tundras, volcanoes, exotic landscapes and fantastic environments. The good part is that there’s a more appealing background to look as you play; the bad part is that it distracts you from the game itself because your focus is continuously redirected to the colorful backdrops. 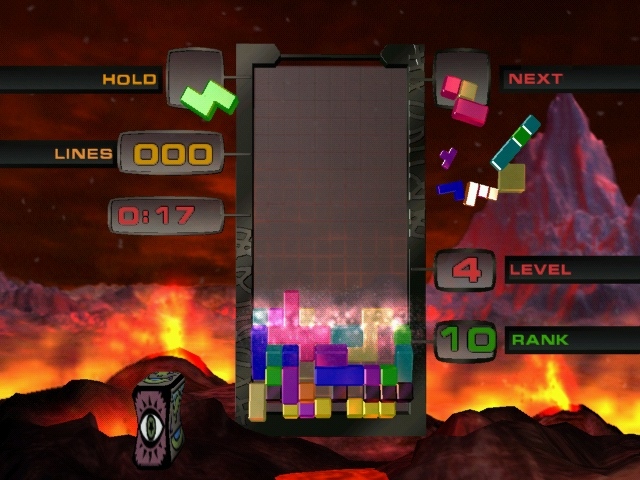 Tetris World PS2 has six different types of Tetris games combined into one collection: hot-line Tetris, fusion Tetris, cascade Tetris, sticky Tetris, square Tetris and “white-bread” Tetris. Players have the option of playing solo or against three others. the new game design and level of difficulty makes it challenging for both beginner and expert Tetris players. There’s the addition of a hold function in the game that allows players to save a specific part of a falling Tetirs piece the then use later on in the game. That part can then be used place of another piece, making the game slightly less frustrating depending on the level of difficulty. Another addition that eases the play is that once a Tetris piece reaches the bottom, it can moved around continuously so it doesn’t set, thus giving you time to find a new location to place it in and get more points, while the next piece is making its way down. These new techniques and additions make the game quite simple, especially for newcomers, but it takes away the challenges of leveling. Players of all ages have always been and will always be loyal to the Tetris challenge, but the new Tetris World PS2 lacks the opportunity for fast thinking and reflexes. In the past, Tetris pushed players to a new limit, forcing them to think faster, but with Tetris Worlds PS2 smooths the whole process out.